Light casual eatable like fried snacks, cutlet, sandwich, chips, momos, spring roll etc. Melancholic music at the campsite. March through tough trail sometime navigating your way through dense forest, steep paths or the mountains. The exceptionally high, moderate Himalayan expedition of Hampta Pass Trek with amazing background of exploring your life with unique tones of nature. You will get an incredible perspective of rock faces, glacial valleys, thick pine forest, open meadows, adrenaline pumping waterway and pleasant as well as daring adventures in the Himalayan region..
-Hampta Pass is an unusual and unique pass where you come out of the green valley of Kullu valley to desert lands of Spiti. The trail of Hampta Pass trek is extremely exceptional and loaded with tremendous variety in the trails; grand scenes, open green fields and knolls and glacial valleys. It is easy to access starting from Jobra. The trek is a delightful adventure and spine chilling moment while crossing of the pass makes the trekking expedition to Hampta Pass an exciting one. - Chandratal is counted among sacred lakes of India. It is the center of attraction in the Spiti Valley. The camping site here is definitely a great place to have the views of the barren yet colourful mountains of Spiti Valley. 11:00 AM - We will start from our pick up point(Manali Taxi Stand). We will leave for Jobra via SUV. Jobra is a small village at 9000 feet height with a lovely view of lush pine forests. From Jobra, we will trek to Chikka crossing the Rani Nala. This short and easy ascent trek is about 4km. The mesmerising topography of the Himachal will welcome you with grand meadows and forests, you barely realize the climb. While trekking, walk along Rani River who welcomes you in the surroundings of huge rocky hills. We will have lunch while trekking on this trail. We will camp at Chikka and enjoy majestic views of Dhauladhar ranges. 4:00 PM - You will learn to setup tents with our instructors. The evening will be special with the first bonfire of the trek and snacks will be served at sunset with the music to set up the ambience and later we will continue with dinner and enjoy under the star gazing. 6:00 AM - Wake up early, and welcome the sun with the most relaxing and joyful exercise, Yoga. A few asanas and breathing exercises(Pranayaam) to intake the freshness of the mountains and sunrise. The first camping breakfast will be served, later we will leave for Balu ka Gera (Bed of Sand). The journey continues along the stream and Balu ka Gera is 5 km ahead. The packed lunch will keep you energized during the trek. You will feel the excitement of being in the Himalayas as you encounter the first glimpse of the outer Himalayan Ranges of snow capped mountains with the Dhauladhar ranges begin to appear. 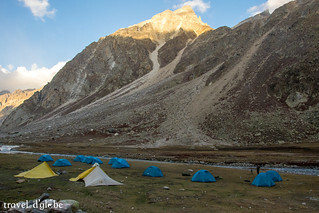 Balu ka Gera is a great camping place on ground level and ahead you are the mountains you will conquer the next day to cross the mighty Hampta Pass at 14000 feet. We will set up our tents here and have meals here for the rest of the day. Trekkers will be free to explore the beauty of Himalayas and there will a photography session, explaining the basic and capturing good landscape photographs. 6:00 AM - Higher Himalayas will give you the panoramic view of the ranges, of which you click the best of dawn photography and make lifetime memories. Repeat the asanas and breathing exercises to stay relax and energize for the day trek. 9:00 AM - After breakfast we will begin our day’s adventure. Today’s trek will be broken into two stages. The climb to the Hampta Pass, which is a moderately steep rocky ascent. You will feel the excitement of making it at the top of Hampta Pass. The trail is followed by a steep and another rocky descent to Shea Goru(12,900 Feet), along the riverside. The view is astounding, tiny yellow and orange flowers blooming on the ground in the scenery of stream and mountains give a lovely picture. 3:00pm - We will take a small break on the top of the pass and have lunch on the summit point. After then we will start descending toward Shea Goru and our campsite along the banks of the river. 6:00pm - After we put up our camp, we will explore the views of wide Himalayan ranges at sunset. You should not miss to capture those colours in the sky with your cameras and in your memories. Later we will go on to have dinner with bonfire and team games. 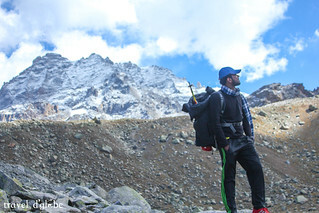 7:00 AM Last morning in the high Himalayas, you will have every chance to do what you have missed out on previous days. 10:00 AM - Shea Goru is placed at an altitude of 12,900 ft and Chatru at 11,000 ft. Today's trek is gentle descent along the stream. The trek is well defined and less rocky compare to previous day trek. The trail here again is by the side of the river valley between mountain ranges. You will move alongside the river in the valley between the mountain ranges. No vegetations can be seen in the barren mountains, you will have the first view of Chandra River. Chatru is a nice campsite along the river. After setting up the camp, you can explore the places, dhabas at Chatru and later we will eat our meals and enjoy our last night stay with Karaoke, food and stars. 9:00 AM - Drive to Chandratal/Manali from Chatru. Provided with suitable weather conditions, we will ride through road along the banks of Chandra River via Batal, up to the marvelous Chandratal lake of Spiti Valley. It is also known as the moon lake. The sheer blue color of the lake has an amazing effect to the surroundings. 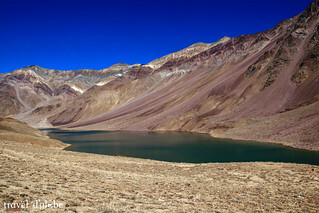 Chandratal Lake is 70 kms from Chatru camp site and a few hours from Chandratal camp site. We will stay at Chandratal for two hours, enjoy the photography and lunch at Chandratal. It will take nearly seven hours to complete the journey and reach Manali via Rohtang Pass. 7:00 PM - We will reach Manali and happily end the trip with memories. This is the best trek to get introduced with the Indian Himalayas. Completed it last year July and still its memories are fresh in my mind. The terrains and the passes used to get a bit difficult at times, but can be passed easily. Besides, the way the trek was arranged from guides to porters, foods to accommodation, added more fun and excitement to the trek. Hope, it remains the same forever and we can enjoy its untouched and magical beauty. Situated on the Beas river it’s a gateway for skiing in the Solang Valley and trekking in Parvati Valley. 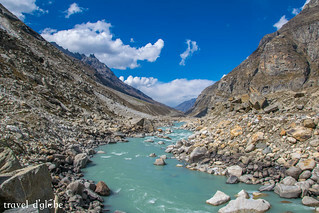 It is a popular tourist hotspot for Indians in summer and a magical, snow-covered place in winter and has a reputation as a honeymoon destination and backpacking center who come for the cool mountain air and a taste of snow on a day trip to the Rohtang La. It's also a jumping-off point for paragliding, rafting, canyoning and mountaineering in the Pir Panjal mountains. Manali has everything for all adventure and nature lovers.